I got this slightly-battered softcover from a local Savers thrift shop, for another release copy. I first discovered this series via its TV Tropes page, and have enjoyed the manga as well as the anime adaptation. 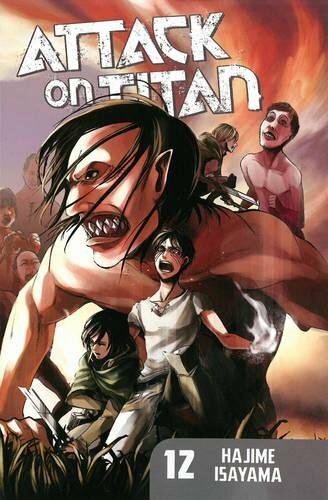 This volume picks up from Volume 11, in the middle of a very tense situation indeed, with Eren the captive of the two human/Titans whose identities were such a shock. (This volume also goes right into the story - there's no cast-of-characters page here.) We pick up quite a bit of character motivation on both sides (or on all sides - it isn't quite clear just how many "sides" there really are), including about Krista and Ymir and their relationship, about the motives (and inner torments) of Reiner and Bertolt, and the hopes and fears of the Survey Corps members as they attempt to cope with their new knowledge, and try to rescue Eren. Lots of chases, wildly dramatic battles, and some tantalizing hints of the past - including one that suggests that there's more to Eren's own back-story than we know so far. Conflicting loyalties, unexpected reversals, and lots and lots of dismemberment (some fatal, some not)... definitely a pivotal volume in this traumatic series!